Republished from Axis Maps / IndieMapper. Indieprojector is a free web service that re-projects digital map files and converts them to SVG for use in vector graphics editing software. 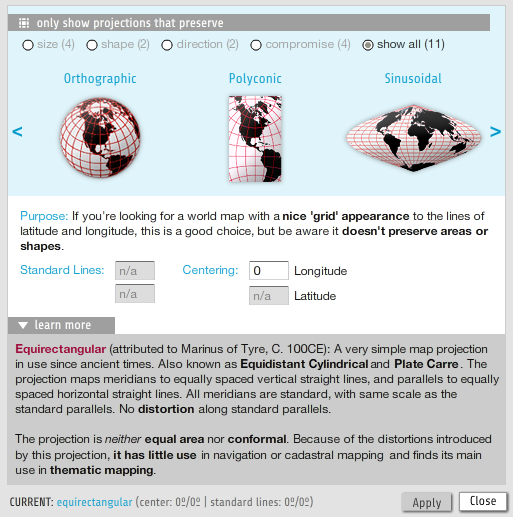 Map projections are an essential part of map making but we found the existing tools to be too expensive, inflexible or complicated. 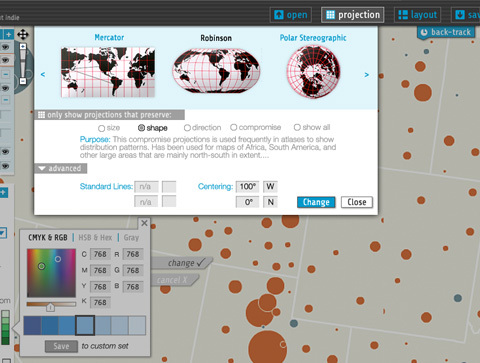 Indieprojector is the smarter, easier, more elegant way to reproject and convert geographic data. It’s a preview of our indiemapper technology that will bring map-making into the 21st century using web-services and a realtime visual approach to cartographic design. Read more and watch demo screencast . 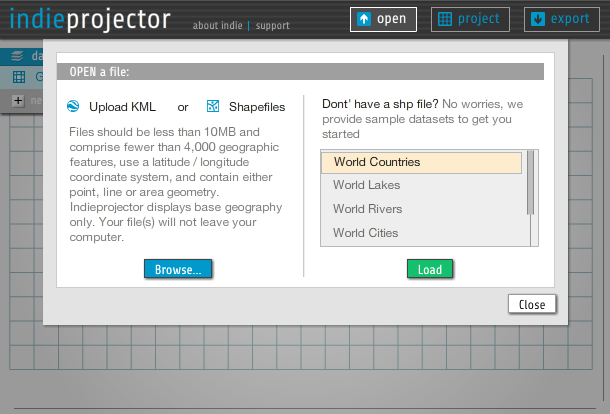 . .
Go directly to IndieProjector to reproject your KML and shapefiles . . .
Republished from the Axis Maps IndieMapper blog. Add yourself to their email list to get the 411 on the first release. Note: David Heyman of Axis Maps was at SXSW Interactive 2009 this weekend in the NeoCartography: Mapping Design and Usability Evolved session. Welcome to indiemapper.com! We’re very excited that you’ve taken the time to learn about our project. Put your email address in the subscription box below so we can tell you about indiemapper developments and most importantly… the launch! It’s big. We’re not satisfied with the current tools available for making maps. They’re too expensive and their cartographic functionality doesn’t always give us everything we need. We’re building indiemapper to replace those tools. It takes in shapefiles and spits out a vector file to Illustrator, just like GIS. It supports multiple projections, just like GIS. Labeling, map layout, data classification, just like GIS. If you need it to make a map, it’s in there. It’s focused. The problem with the existing tools for making maps is that they aren’t designed exclusively for making maps. 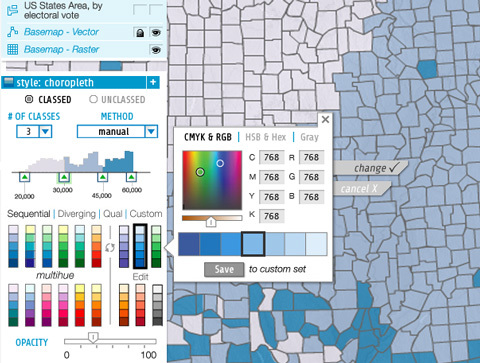 You’re only using about 10% of the software to make your map (but paying for all 100%). We built indiemapper for only one purpose: making maps. It’s visual. If I want to reclassify my data, why do I need to go into the map properties dialog box, select the symbology tab, click on the data classification button that opens up a new window, move the tabs around in that new window, click OK in the new window, click OK in the first window I opened and then wait for my map to redraw to see if the classification looks good? With indiemapper, every update is live and every control is easily accessible. No more hunting. No more waiting. I could go on and on, and I will, right here on this blog. 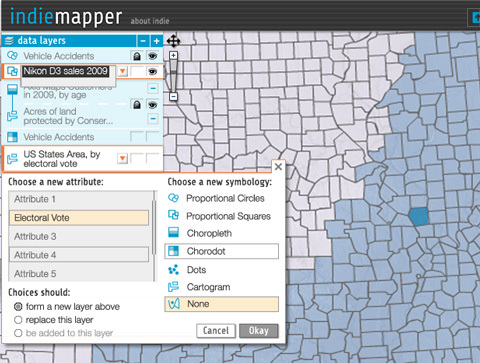 Check back here for a discussion on functionality, coding, design, cartography, all things indiemapper. We’ll be releasing some free tools along the way that we’ll want to tell you about too. Most importantly, we want your feedback so let us have it! Nothing more than 2 clicks away. Rolling release with constant updates. Load data from shapefile and KML formats. 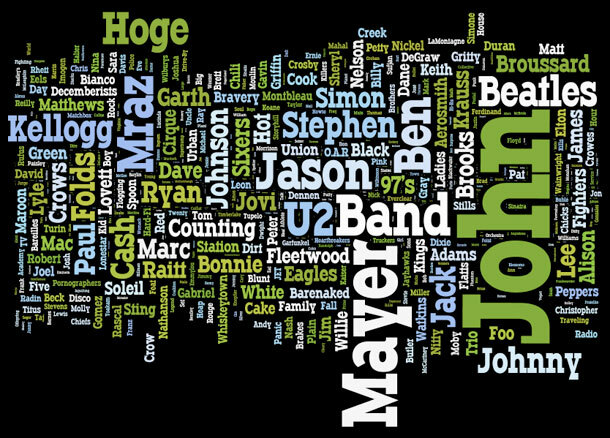 [Editor’s note: This awesome tool from Jonathan Feinberg, a researcher at IBM, displays tag clouds the “right” way by packing the words into the interstitial space between tags and rotating tags from the horizontal baseline. Johnathan uses simple bounding box logic to accomplish this. I will look into adding this to my Adobe Illustrator script (and perhaps bound the tags into a user-defined shape like a heart for Valentine’s day). If you look at the HTML tag cloud that is generated for my blog at the right sidebar you’ll see a bunch of text on the same horizontal baselines. That type of tag cloud wastes a lot of space by not packing the words closer together. If there is a big word with small words on 1 line, there is a lot of wasted white space around the smaller words on that line. Fast but not pretty. And only horizontal. Up until now packed tag clouds have taken tedious hand-placement by an artist. AppleInsider.com’s Prince McLean produced a three part series earlier this month on the Flash Wars. Direct links to Part 1, Part 2, and Part 3. Pitted against Microsoft’s efforts to crush Flash using its own copycat Silverlight platform, open source projects seeking to duplicate Flash for free, and Apple’s efforts to create a mobile platform wholly free of any trace of Flash, Adobe has scrambled to announce efforts to make Flash a public specification in the Open Screen Project. Will it help get Flash on the iPhone? Here’s the first segment of a three part series with a historical overview of the wars between Flash and Adobe, Microsoft, Sun, Apple, Google, and the open source community, the problems Flash faces today, and what future Flash can hope for as an open specification. Flash originated at FutureWave Software as SmartSketch, an innovative drawing tool. In 1995, the software was repositioned as FutureSplash Animator, with support for cell based animation. It was pitched as a way to quickly draw and animate vector-based graphics for efficient delivery over the web, as a direct challenge to Macromedia’s heavier and more complex Authorware and its Director-created Shockwave content. FutureWave pitched the product to Adobe, but it was Macromedia that bought it in 1996, hoping to integrate it as an approachable, entry level member of its content production tools as the company’s business was rapidly pushed from CD-ROM oriented products to the web. Macromedia abbreviated the name from FutureSplash to Flash. It turned out that the easy to use Flash rapidly sidelined Macromedia’s existing Authorware and Shockwave. Flash made it easy for designers to create interactive content with only minimal development knowledge. The real break for Flash came when Macromedia lined up a bundling agreement with Microsoft’s Internet Explorer 5, which resulted in the Flash player software being widely distributed. While Microsoft embraced Flash, it actively worked in parallel to stop Sun’s Java and Netscape’s web browser as threats to Windows. Microsoft’s efforts to sideline Java into a Windows programming language and its strategy to embrace and extend standards-based, platform agnostic HTML into web pages that only worked in Internet Explorer gave Macromedia’s Flash fertile ground to grow as a quick and simple alternative to the more complex and resource intensive Java as a way to create simple, interactive applets on the web. Adobe purchased Macromedia in 2005 largely to obtain Flash, the crown jewel of Macromedia’s web development tool assets. Prior to owning it, Adobe unsuccessfully worked hard to kill it as a competing product. In 1998, when Macromedia and Microsoft submitted VML to the W3C as a potential web standard for vector graphics (based on Microsoft’s RTF), Adobe teamed up with Sun to push the rival PGML specification (based on Adobe’s PostScript). The W3C developed a new standard that drew from both, called SVG (Scalable Vector Graphics). Adobe pushed SVG as a competitor to Flash right up until it bought Flash, distributing the Adobe SVG Player as a free web plugin. Microsoft continued to push its own VML, which it built into Internet Explorer. This prevented either VML or SVG from making much progress, as other browsers didn’t support VML, while the SVG open standard saw little adoption given Adobe’s weak presence in web development tools. That let Flash easily win out over both as the way to develop and present animated vector graphics on the web. Continue reading on AppleInsider.com . . .